Neither morning rain, nor wind, nor thunderstorms could keep 30,000 wet and wary Boston Marathoners from their 26.2-mile appointed rounds on Monday. World-class runners and novices alike, they were rewarded by the fickle weather gods with unexpected flecks of sun, drying roads — and then, a desperate, furious duel at the end of the men’s race that added a did-you-see-that coda to a carnival-like Patriots Day. “They were neck-and-neck right at the end,” said Cameran Schwarz, 19, a Boston University student who watched wide-eyed as Lawrence Cherono of Kenya surged past Lelisa Desisa of Ethiopia just before the finish line. Klodian Mitri also was positioned near the Boylston Street finish for the stunning final moments of the men’s race. Take a look at the finishing order by gender, division, New England state, and more. Fears of a repeat of last year’s cold, miserable, soaking conditions evaporated as the day wore on, replaced by the excruciating euphoria that has always been the Boston Marathon. Along the punishing, storied course from Hopkinton to Boston, the streets filled with cheers for loved ones and strangers who streamed and struggled past in this, the 123rd edition of the world’s oldest annual marathon. Sparky Kennedy staked out a prime spot on Beacon Street in Brookline as she waited for her husband, Jake, to stop for a kiss and a round of hugs during the final miles of his 37th Boston Marathon. She and her two sons were tracking Jake, a 64-year-old physical therapist in Boston, as he made his long, familiar way toward them. Although his first Boston Marathon occurred back in 1982, Sparky was still filled with nervous energy as she waited and watched the first female runners and the wheelchair competitors whiz past. “I enjoy the excitement. I also enjoy it when I find a parking spot,” Sparky Kennedy said with a laugh. “Enjoyment” was a relative term before the race, as dripping-wet runners boarded buses in Boston for the ride west to Hopkinton early in the morning and tried to stay dry once they arrived. Orinthal Striggles, 43, of Columbia, S.C., was about to run his 65th marathon. He said he’d never seen race conditions like the storm that hit Boston in the morning. To prepare, Striggles knelt on a wet brick sidewalk on Boylston Street and tied plastic shopping bags over his neon green sneakers before hurrying to board a bus. Boston Common was awash in multicolored rain jackets as runners checked in about 8 a.m. Some shuffled through puddles and pulled hoods over their heads as the rain picked up. Slowly, they began packing into rows of yellow schoolbuses that stretched along Charles Street. Danielle Wiechertjes of Michigan stood close to her husband, John, underneath an umbrella. As a breast cancer survivor and first-time Boston Marathon runner, she found the rain couldn’t dampen her excitement. Another runner who was pumped was race-car driver Jimmie Johnson, who found time while competing on the NASCAR circuit to run his first marathon in 3 hours, 9 minutes. Boston police had reported no major incidents by Monday evening, when showers had returned. 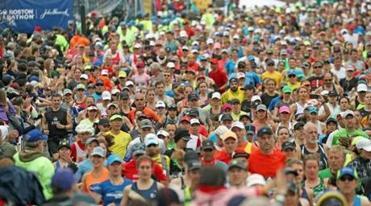 Authorities said 77 runners were taken to hospitals. Earlier, the weather wasn’t the only thing that brightened as runners started in staggered waves toward Boston. A wall of noise greeted them at Wellesley College, near the halfway mark, in an adrenaline rush that helped bridge the miles to the spirit-testing Newton hills. Many runners stopped for a friendly peck. The tradition is a core part of Wellesley’s legendary “scream tunnel,” but some students weren’t accepting kisses from just anyone. “Kiss me only if you’re over 6 feet, have a 401K, are secretly a prince, can speak six languages, can cook, will agree w/ everything I say, handsome, nice to my mom, nice to my dog, & OVER 6 FEET,” read a sign held by Deavihan Scott. The Wellesley senior said a few runners had tried to kick the sign, although nobody had connected by noon. Most of the people didn’t read it closely enough, she said, and had tried to kiss her instead. For much of the morning, students worried that they wouldn’t be able to hang banners at all. After last year’s rain left soggy, disintegrated signs all over the road, the students almost called off the display amid the morning rain. Travis Andersen, Steve Annear, Rachel G. Bowers, John R. Ellement, Matt Pepin, Jaclyn Reiss, and Emily Sweeney of the Globe staff, and correspondents Jenna Ciccotelli, Greg Levinksy, and Sophia Eppolito contributed to this report. MacQuarrie can be reached at brian.macquarrie @globe.com; Rosen at andrew.rosen@globe.com.